There may seem a lot of stages here, but it’s simply a matter of splitting the mixture to create three different-coloured layers. If you’re not in a stripy mood, just make the whole thing in one shade, keeping the gelatine, blueberry purée and creamy mixture in single batches. But if you do make the extra effort with the layers, you will be rewarded with a stunning candy-stripe finish that will wow your friends. Vary this recipe with any other berry purée you fancy. 1. Line the sides of your cake tin with parchment paper (do not grease). If the tin isn’t quite the required 10cm deep, just use a strip of paper that is at least that tall and so stands higher than the top of the tin. This will work to hold the top of the cheesecake in place. 2. To make the filling, the gelatine leaves will need to be soaked in three separate batches, one for each layer, so they don’t stick together. Place 3 leaves in one large bowl, 3 in another and finally 4 leaves in a third bowl that is distinguished in some way so you don’t mix them up. Pour just enough cold water over each batch to cover and leave to soak for 5-10 minutes until softened. 3. To make the base, melt the butter in a medium saucepan on the hob or in a bowl in the microwave. Blend the biscuits in a food processor, or seal in a food bag and bash with a rolling pin, until you have fine crumbs. Tip into the melted butter, add the cinnamon and stir well to coat evenly. Spread evenly in the prepared tin. Chill in the fridge for 15 minutes to firm up. 4. To make the blueberry purée, rinse the berries and simmer in a medium saucepan on a gentle heat with a small dash of water for 4-5 minutes until softened, tossing occasionally. Blend in a food processor or liquidiser until really smooth. This will keep for 2-3 days, covered in the fridge. 5. Then gently heat the berry puree in a small saucepan on the hob or in a bowl in the microwave until it just comes to the boil and remove from the heat. Drain the water off the now-softened gelatine, squeeze the excess water from each bundle and pop them back in their respective bowls. Pour 50g of blueberry purée into one of the bowls with three gelatine leaves, 100g into the other bowl with three leaves, and then the remaining 225g of purée into the bowl with four leaves. Stir each one until the gelatine dissolves and leave to cool. 6. Beat the cream cheese and sugar together in a food mixer until well combined and smooth. Quickly beat in the crème fraîche and add 650ml of the cream. Beat the mixture for a couple of minutes until softly whipped up, taking care not to allow it to become too stiff. Cover with cling film and set aside in the fridge. 7. Once the bowls of gelatine and purée are cool, divide the creamy mixture equally (in roughly 525g batches) between the three bowls and gently fold it in until well combined. Spoon the lightest coloured mixture onto the biscuit base, spreading it out evenly. Add the middle shade in the same way, then cover with cling film and chill in the fridge for 30 minutes until firm. Finally, add the darkest layer, smooth the top out evenly, cover with cling film and chill in the fridge for at least 5 hours or overnight until completely set. 8. Carefully remove from the tin and onto a cake stand or serving plate. Gently peel the paper away to reveal the stripes. Lightly whip the remaining 150ml of cream to soft peaks and spoon it on top. 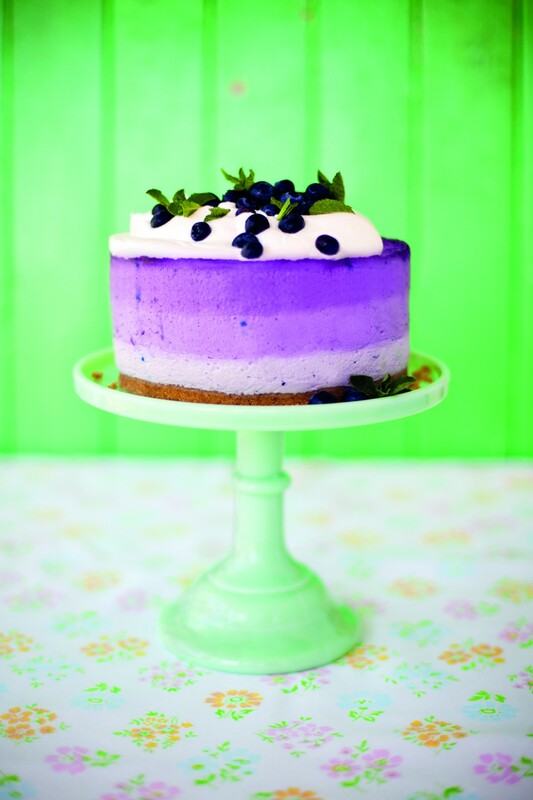 Scatter with the fresh blueberries, decorate with mint sprigs and serve. 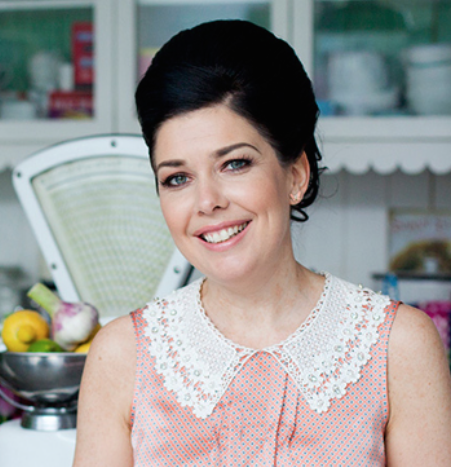 Hi, I’m Sharon, a food stylist and writer. I’ve worked for over 16 years between London, New York and now Dublin with some of the top names in food in the media (think Jamie Oliver, James Martin, Lorraine Pascale and Ina Garten). You can share my experience, top tips and style secrets at sharonhearnesmith.com or follow me on Twitter.